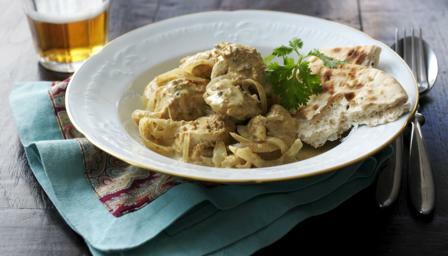 This mild Indian-style dish is spicy rather than hot and relatively low-fat. Marinate the chicken slowly for more flavour. Mix together all the marinade ingredients to give you a loose, smooth paste. Add the chicken pieces and coat them in the paste. They are best left to marinate for around 30 minutes to 1 hour, but if you're in a hurry a few minutes will do. Heat the oil in a deep frying pan and add the mustard seeds. When they start to pop and jump about in the pan, add the onion and garlic. Cook until they're golden brown before adding the chicken and any extra paste from the marinade. Fry over a gentle heat for about 8 minutes before adding the coconut milk. Increase the heat slightly and bring to a simmer. Cook for a further 10-12 minutes until the sauce has thickened slightly before seasoning with salt if necessary and serving with rice or naan bread.